Something that you and the kids can have fun making. Heat oven to 190C/fan 170C/gas 5 and put 16 gold cases into a fairy-cake tin. Tip all the ingredients for the cake into a mixing bowl and beat for 2 mins with an electric hand-whisk until smooth. Divide between the cases so they are two-thirds filled, then bake for 12-15 mins until risen. Cool on a wire rack. For the frosting, microwave the chocolate on High for 1 min. Cream the butter and sugar together, then beat in the melted chocolate. 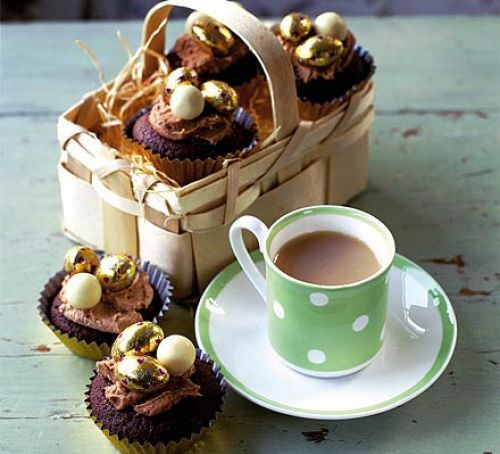 Spread on the cakes and let the children decorate them with Maltesers and chocolate eggs. These easy Chocolate Fudge Cakes are simple and fun to make and make great gifts to give friends and family members at Easter – if you manage to not to eat them all first.